The genus Jancaea (Boiss) Boiss, with one monotypic species, Jancaea heldreichii was published by Pierre Edmond Boiss in Flora Orientalis 1: 4 (Feb. 1875). A synonym is considered Jankaea Boiss. (Sept./Oct. 1875). The genus is named in honor of Viktor Janka von Bulcs (1837-1890), a Hungarian botanist. (Note: In many papers and floras the name “Jankaea“ is used, but a proposal to conserve that spelling (Skog 1983) was not accepted. Synonym: Ramonda heldreichii (Boiss.) C.B.Clarke, Flora Orientalis Nov. 1: 5 1875. Note: The genus/species is unmistakable by the dense, white-woolly rosettes. It is closely related with (and has been sometimes included in) Ramonda, differing mainly in the tubular-campanulate corolla. The inclusion into Ramonda is supported by molecular data (Möller et al. 1999). 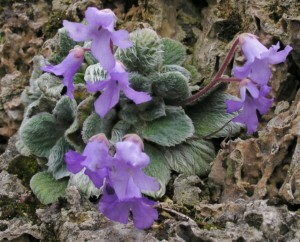 The genus Jancaea, has only one species, Jancaea heldreichii which is known to have several large and stable populations and grows in damp shaded crevices of limestone rocks, especially near streams. It prefers the north sides of rocks at elevations mostly between 700-1400 meters (2300-4600 feet) although it has been observed at lower, and as much as 1000 meters higher. In general, it has been estimated that each 1000 meters rise in elevation from sea level, represents a 10 degree C drop in temperature. This species is protected in Greece by Presidential Decree and is included in the Red Data Book*. The comparative element of the tree line, becomes even more relative when compared to the other plants and animals that inhabit the same ecosystem. Other plants that grow here are Asplenium trichomanes, Saxifraga scardica and plants known as Sarcopoterium spinosum (Rosaceae) which also may be “poikilohydric” or able to survive dessication and revival from dry periods. Jancaea is strictly pollinated by various species of bee and has a high success in setting fruit and seed production. *Delipetrou, P. 2011. Jankaea heldreichii. The IUCN Red List of Threatened Species 2011: e.T162254A5564827. http://dx.doi.org/10.2305/IUCN.UK.2011-2.RLTS.T162254A5564827.en.